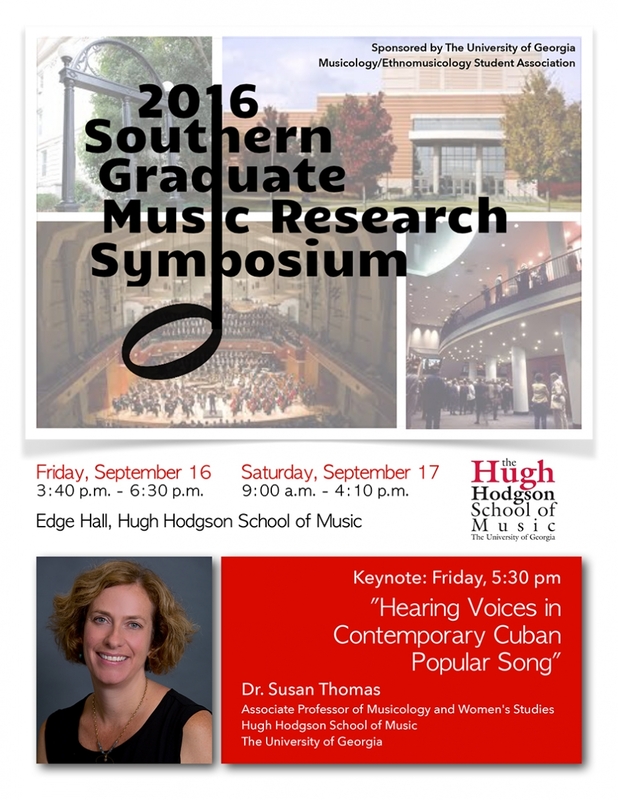 The University of Georgia Musicology/Ethnomusicology Student Association is pleased to announce the sixth annual Southern Graduate Music Research Symposium, Friday and Saturday, September 16-17, 2016 at the University of Georgia Hugh Hodgson School of Music in Athens, Georgia. The symposium will run Friday afternoon through Saturday afternoon with a keynote presentation by Dr. Susan Thomas on Friday at 5:30 p.m. Fifteen student papers will be presented over the course of the two days. Please click here for abstracts of papers to be presented. UGA students are committed to making this symposium as affordable as possible for all attendees. Overnight accommodations with student hosts will be available and a $15 registration fee will cover the cost of dinner on Friday and breakfast and lunch on Saturday. The Southern Graduate Music Research Symposium is a collaborative event, organized by and for graduate students, whose mission is to support graduate student research in music and to foster a collegial research environment among regional schools in the South.